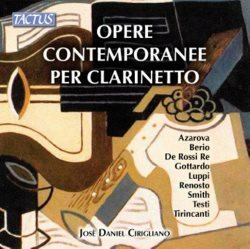 This disc is as much a demonstration of the art of clarinettist Josè Daniel Cirigliano as it is of the compositional strengths of the writers. For any who usually fight shy of contemporary music it will be a challenge but my advice is to stick with it. It is ultimately a rewarding experience as well as showing what amazing feats can be achieved with the various clarinets represented here. The first piece on the disc, Cachucha, is truly extraordinary and is the most experimental. In the booklet notes it is described as ‘a mesmerising Andalusian folk dance’ and no doubt one has to take the writer’s word for it since it the clarinettist who wrote them. It involves all kinds of blowing techniques and making sounds other than musical ones into the mouthpiece. There is an element of hilarity about it caused by these strange flights of fancy as Cirigliano growls as well as talks into his instrument. William O. Smith’s Ritual is another experimental piece this time requiring the playing of an A and a B-flat clarinet simultaneously. This time words drawn from medieval Japanese writings are also spoken. The disc declares itself to be a world première recording though the Berio at least has been recorded many times. His Sequenza IX, for B-flat clarinet is one of 14 pieces written for various instruments including voice and cello and this one has also been adapted for alto saxophone and bass clarinet. It is a measure of the contemporary nature of the majority of works here that, set against them, the Berio sounds positively ‘tame’. In keeping with the rest of them his piece seeks to challenge the instrument and, by extension the player, by making it perform to the very limits of its potential. The final work is the shortest but what it lacks in length it makes up for in content for Clarinettologia is a jazz-inspired piece. It is just as challenging as any of the others with extremely fast runs up and down the instrument of which the great Benny Goodman would have been proud. Cirigliano comes through every challenge with extraordinary aplomb and proves himself to be the most staggering clarinettist. It is unsurprising that he has pieces, such as the first one by Fabrizio De Rossi Re, dedicated to him. Though this is not really a disc that many will want to listen to all at one sitting the pieces grow on you while having you marvel at Cirigliano’s artistry.